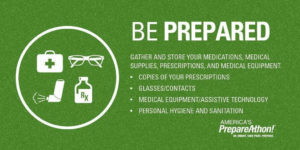 We can help ensure your emergency kit is stocked with the items suggested by Ready.Gov. Most items are inexpensive and easy to find, and any one of them could save your life. Headed to the store? Download a printable version to take with you. Once you take a look at the basic items, consider what unique needs your family might have, such as supplies for pets, or seniors. Here at MCR Medical we offer various items to keep you prepared. Our first aid kits, emergency blankets and sleeping bags are just a few emergency supplies we carry. We recently added our Grab-N-Go Warm hand warmers to our product line. With our infamous Fast-N-Free shipping we can help you prepare without breaking the bank. Below you can check out the various places you should keep a kit. Vehicle: In case you are stranded, keep a kit of emergency supplies in your car. *In 2016 we made vehicle emergency kits as gifts to our MCR Medical friends and family. These were a huge hit and most are still in our cars today. Be safe out there and please visit our website MCRMedical.com for more information on our products. You can also email us at sales@mcrmedical.com or call 614-782-2100. Previous Previous post: Grab-N-Go Warm Hand Warmers ‘Shake Up’ the Industry! Next Next post: What Kind of Prestan Manikin Are You Buying?